Announcement Game of Thrones fans love Trendycoasters to buy their Game of Thrones beer labels. Game of Thrones fans love Trendycoasters to buy their Game of Thrones beer labels. There is still time to get by Xmas, and free priority shipping in the U.S.
My newest creation Game of Thrones foaming hand soap on my other Etsy store. Busy, busy, busy....trying to keep my head above water. 30+ orders being packed, and shipped today. All packed, and ready to ship. Packed, and ready to ship. Trendycoasters brings Game of Thrones fans joy, happiness, and lasting memories. I started my coaster business here on Etsy in October 2012. 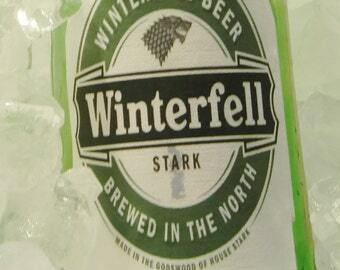 I started off with an idea after seeing a design of beer labels for Game of Thrones. I look forward to many more happy, joyful, and satisfied Game of Thrones fans in the coming years. Thank you again to all of my customers who have made my business a success. I love the Game of Thrones, and enjoying a cold beer while watching the show. This is what inspired me to create my coasters and beer labels. To fulfill your order, you must provide me with certain information (which you authorized Etsy to provide to me), such as your name, email address, postal address, payment information, and the details of the product that you’re ordering. You may also choose to provide me with additional personal information (for a custom order of coasters, wall art, or beer labels, for example), if you contact me directly.